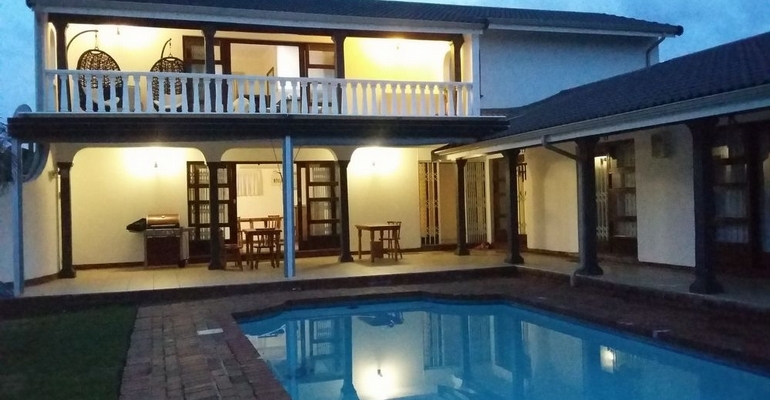 Valhalla B&B is an exquisite little guest house sat virtually on the beach at Uvongo, KZN, South Africa. We offer three, stunning double guest rooms, all en suite with fridge, tea/coffee, DStv, free Wi-fi, ceiling fan and wonderfully comfortable king size beds! Two of the rooms have a small kitchennette complete with microwave and crockery and small breakfast nook. Children are welcome (Room 3 has bunkbeds for three chidren). All the rooms (and the communal lounge/dining room) open up onto the secure and private courtyard-type garden with sparkling pool and braai facilities. The premises are private and secure and guests may safely park their cars behind a motorized gate. Prices vary at different times of year but start at R350 per person per night sharing. Breakfast is available at R30 per person for a light breakfast, or R50 per person for a cooked, plated breakfast. There are plenty of activities to suit all tastes and age groups in the area. For those who love the beach, Uvongo (and Uvongo Falls) is a mere 80 meter walk away, with St Michael’s, Shelley Beach and Margate (beach), with all its sizzling night life, all within a 4 Km radius. Wild Coast Casino – or shop till you drop at any of the local shopping malls!